This year conversation about transliteracy has really taken off amongst North American librarians. Bobbi Newman's work initiated a lot of interest resulting in a great collaborative blog Libraries and Transliteracy and gave rise to many other blog posts and discussions which come through to me almost every day via Google Alerts. Recently Google brought me a discussion on David Rothman's post Commensurable Nonsense (Transliteracy) which starts "It is entirely possible that I’m just dense, but everything I’ve read recently about libraries and “transliteracy” seems like nonsense to me." That post has set off a long argument which seems to involve just about every US-library-related name I've come across in the last year, and it continues in the comments to a follow-up post. This is great, because when the term was first developed here at the Institute of Creative Technologies we knew we could not find all the answers but we felt sure that others would take it up and bring new insights we had not been able to imagine ourselves. However, most of the conversations I have read around libraries and transliteracy tend to be internal facing within the community, with few references to the Transliteracy Research Group blog, so I would like to recommend it as an excellent source of new transliteracy thinking across many perspectives and subjects. As it happens, the library world has been the first to take up the baton, but it could have come from any number of other disciplines as our collaborative blog demonstrates, and it's important to keep that diversity going. In my view, transliteracy is a bit like the story about the blind men and the elephant, where the elephant = massive changes to the way we understand the dynamics of communication media. Everyone encounters individual aspects of the beast and applies their own meaning, whether the topic is talking face-to-face, on TV, on Skype on your iPhone, or via an aboriginal campfire story. Or whether it is written in newspapers, carved onto tablets, typed into email or copied by hand (with mistakes) into parchment scrolls. Or whether it is read in a book, on a poster, a website, or from the smoke-trail of a plane. Or in body language, via touching, dancing, clapping or simple gesture. I could go on and on. But few realise the enormity of the whole animal. All of this makes transliteracy very hard to pin down, and the predicament is made worse by the fact that this elephant is also a shape-shifter. For example, ten years ago we had no idea of how important the literacy of using a cellphone would become, or that it would help regions like Africa deal with the hurdle of desktop computing by jumping over it all together and going straight to mobile. Seeing the whole elephant is about realising that ALL of these are interconnected and can be understood in relation to each other through history, culture and context. So transliteracy is a shape-shifting eco-system of behaviours and it is probably neither possible nor desirable for anyone to understand enough to know the whole elephant. The vital thing is to remember it is always there and in constant motion. This means recognising the limits of your own knowledge and acceptng a degree of messiness and uncertainty. I appreciate that some people are uncomfortable with that and prefer to use concepts which are locked down and straightforward, but that's not likely to happen with transliteracy and could even diminish its flexible strength. Those who need that kind of tool should probably look for something else. But I hope they will occasionally set aside a moment or two to consider the elephant in all its complexity. I have recently been experimenting with an exciting new tool called Storify. This allows you to collect bits and pieces of content from around the web and weave it into a narrative. You can use tweets, images, slideshows, blog posts or web pages as artefacts within your narrative to illustrate, provide dialogue and create different textures of experience within one platform. Here, I am using Storify as a curation tool to bring together disparate materials which all relate to the same story. I can add a commentary around these materials to contextualise them and make direct comparisons between sources without fragmenting navigation. This type of curation tool is effectively making snippets of the web into objects or props that can be collected by a magpie storyteller, always on the look out for shiny things, and represented. As I consider the reading experience this presents, I find myself wondering what these web artefacts lose by removing them from their context? How much of transliteracy is about contextual indicators around a unit of communicative material? Some web artefacts can stand on their own and are regularly embedded into other contexts, but others may lose clues to their interpretation, making it harder for someone who is not a competent reader to deduce meaning or make a trust judgement about the message being conveyed. From a curatorial perspective, Storify is very much like running your own museum: you get to decide what to present, what significance to give it and how to weave it into a story in the context with the other objects in your collection. As a storytelling platform, it has the potential to incorporate the key ingredients of action (videos, interactive slideshows, flash animation), description and dialogue (embedded tweets) in a graphical way more akin to poetry. I can certainly see potential for this type of tool as a way of helping people to develop familiarity with different types of online literacy within a narrative context, without the need to move around between different platforms and sites with competing skills requirements. It may also be useful for teaching about the different elements of a narrative, the balance between those elements and different ways in which the pace of the reading experience can be changed using different types of media in an interactive way. 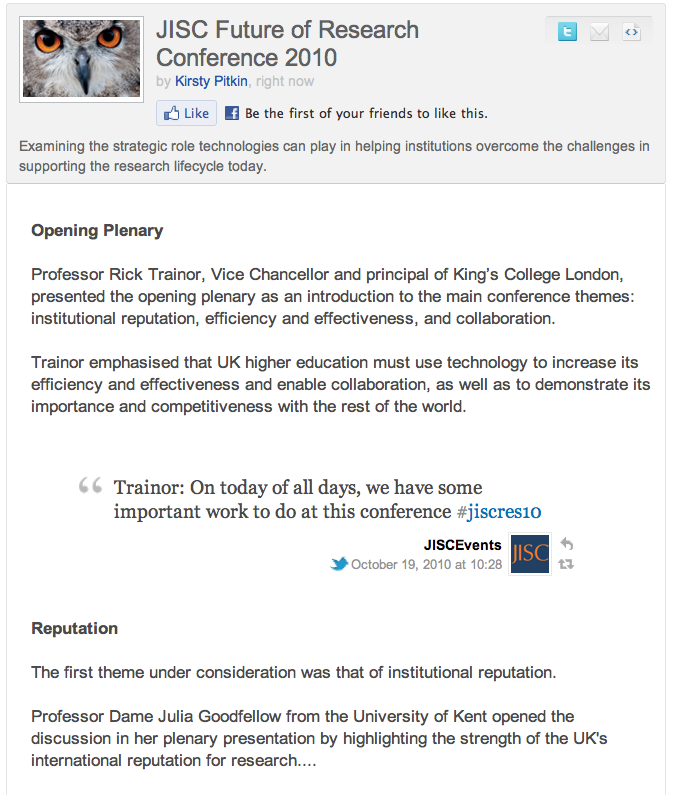 I have written more about how Storify works in practice and the role it could play in communicating conference content here.